The USMC enacted their military dog program during World War II. Marine Corps dogs have participated in every deployment and war since that time. 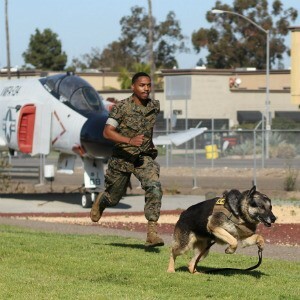 MCAS Miramar hosts a state-of-the-art kennel and training facility. A Working Dog Handler is trained to properly employ a military working dog to conduct searches of vehicles, open areas and buildings for the detection of explosives or illegal drugs as well as to search for lost or wanted individuals. Every Marine or Civilian Police Officer in the program is matched with a dog during their time on base. Being a Working Dog Handler is considered to be an elite job in the military. Dogs on the Miramar base last deployed in 2009. They assist with security teams around the nation at events such as the presidential inauguration and the Republican and Democratic conventions. They also compete in the yearly “War Dawg” competition held at Camp Pendleton. This exhibit was made possible due to the generous support of the Flying Leatherneck Historical Foundation, JCA Photography and MCAS Miramar Marine Corps and Civilian dog handlers. All photography is used with the permission of the National Archive, USMC Archive and/or the DOD National Archive. Make sure to check out our family friendly events from aviation art and NASA Flight Logos display, and artifacts to on site events like Picnic With a Pilot and Open Cockpit Days.